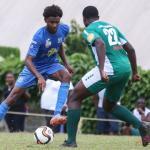 Naparima College and Pleasantville Secondary each capped off historic unbeaten 2018 seasons after claiming the Secondary Schools Football League (SSFL) National Boys and Girls Intercol titles respectively at the expense of San Juan North Secondary and Signal Hill Secondary at the Ato Boldon Stadium in Couva yesterday. 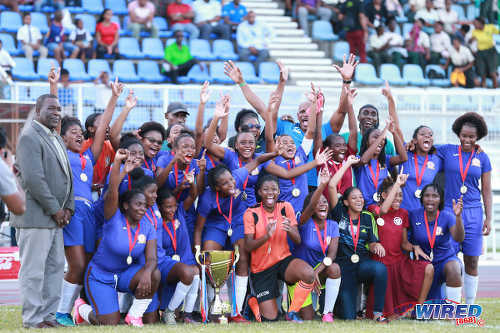 While Pleasantville romped to a 3-0 win over Signal Hill courtesy a hat-trick by finals MVP Alexcia Ali, Naparima had to endure the tension of a 4-3 penalty shoot-out win over San Juan North, after a rugged goalless regulation time draw. Photo: Naparima College celebrate with the National Intercol trophy after their 4-3 penalty shootout triumph over San Juan North Secondary at the Ato Boldon Stadium in Couva. 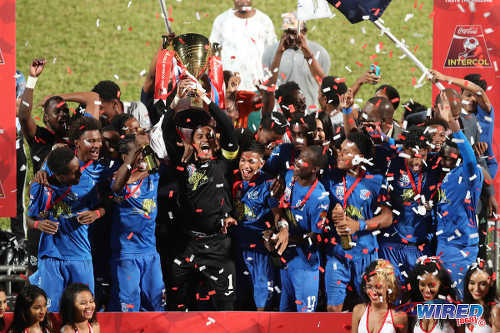 Substitute Seon Shippley slammed home the sixth spot kick, which triggered euphoria among the sea of ‘Naps’ supporters and handed the southern juggernauts their third title for the season after the Premier Division and South Zone Intercol crowns. It was a hard fought victory as both outfits gave no quarter in defence, and penalties always seemed like the likeliest outcome. Naparima won the South Zone Intercol title on penalties last week and Eve was unsure whether his charges could repeat the trick. “To be honest I wasn’t [confident that we could pull off the penalty shootout win],” said Eve. “I didn’t think that lightning could strike twice because the first penalty kick shootout against Pres, we missed the first three. Today after we missed the first two, I said no way. 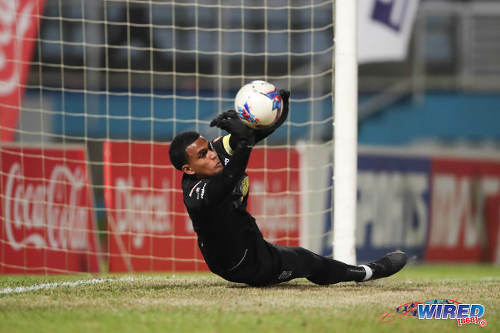 Photo: San Juan North Secondary goalkeeper Emmanuel John saves a penalty during National Intercol final action against Naparima College at the Ato Boldon Stadium on 4 December 2018. 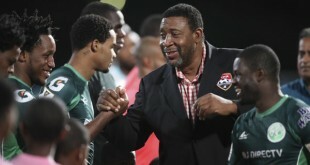 In fact, Tyrike Andrews was a colossal force in central defence for the eventual champions in the final while Kyle Thomas was just as formidable in the San Juan North backline. While the defenders shone in the Boys final, Ali’s attacking prowess decided the Girls final for Pleasantville. Signal Hill started brighter though and used their physical advantage to pressure the ‘P-ville’ team early on. If a Celine Loraine effort from 23 yards had a bit more dip on it—in as early as the fourth minute—it would be the Tobagonians who would have celebrated the opener. 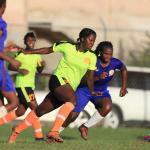 Instead, the ball clipped the underside of the crossbar with Pleasantville goalkeeper Akyla Walcott well beaten. However, P-ville eventually brushed off their opponent’s early dominance and began to get a foot hold of their own in the game. Ali was, of course, in the thick of the action. 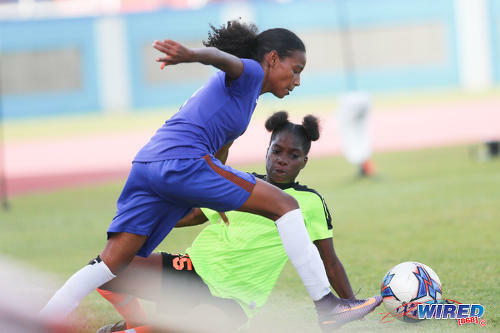 There was one delicate back-heeled pass to midfielder Jasandra ‘Mama’ Joseph whose left footed shot was well saved by Signal Hill goalkeeper Aaliyah Alvarez. It was merely a glimpse of Ali’s dominance on the day; and right after the resumption, she got the goal her classy play deserved. Photo: Pleasantville Secondary attacker Alexcia Ali (left) dribbles around Signal Hill Secondary player Dilleasia Nicholson during the National Intercol final at the Ato Boldon Stadium on 4 December 2018. Chrissy Mitchell, who was played into space down the left flank by Aaliyah Pascall, lofted a dangerous cross into a dangerous area into Signal Hill’s penalty area. Alvarez was slow to come off her line to clear it and Ali pounced to slam the ball into the empty net in the 46th minute. Ali doubled up in the 68th minute, as a long punt from the Pleasantville defence created more mayhem in the Signal Hill defence; and this time Ali produced a flicked finish to put the southerners two goals clear. She saved the best for last, though. There was no indecisive defending in Ali’s hattrick goal in the 72nd minute. This time, they just couldn’t stop her, as he raced away from her markers before unleashing a right footed shot that rippled the net to write her name into Pleasantville Secondary’s football folklore. Levi Fernandez, the other MVP on the night, had a different vision for achieving success in the finals. A clean sheet! 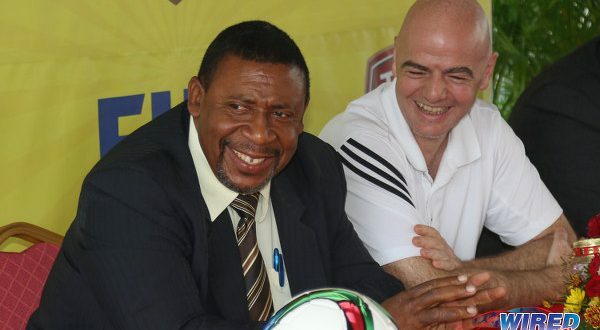 Before the final, Eve suggested that five clean sheets in the Intercol competition should translate to title success. 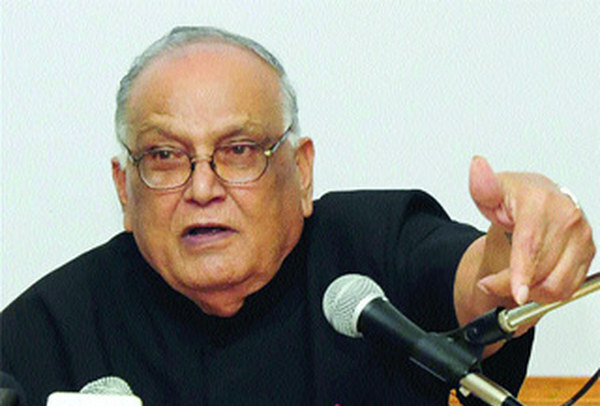 He was proven right. But it was by no means easy against an aggressive San Juan North unit. Photo: San Juan North Secondary midfielder Elair Brewster (centre) tries to fire past Naparima College goalkeeper Levi Fernandez (left) during the National Intercol final at the Ato Boldon Stadium on 4 December 2018. Early in the encounter, the impressive Thomas rose brilliantly at the back stick to thump a header off the frame, after an Elair Brewster free kick—with Fernandez just a spectator. And the game ebbed and flowed with crunching tackles given refreshing acknowledgment from the thousands of supporters. Substitute Jerry Morris forced Fernandez into a smart save low to his right in the second half. 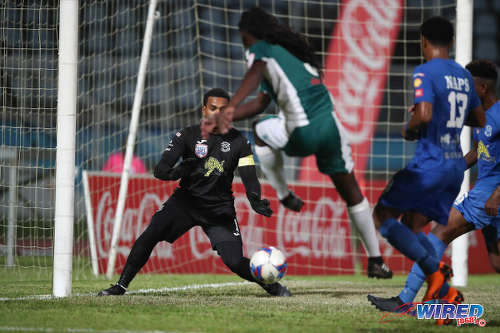 But it was the crafty Naparima midfielder Mark Ramdeen who almost brought the house with the best move of the game on the counter, as he turned on a dime to leave one defender for dead and unleashed a powerful angled strike that cannoned off the frame of the goal. The night did not get much better for the talented attacker unfortunately. 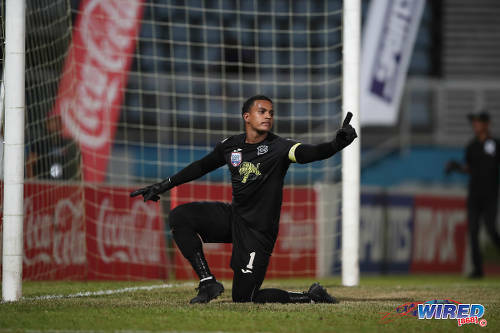 Emmanuel John wrapped up penalty kicks from Ramdeen and Jeron Pantor to leave the south team reeling, even though San Juan captain Renaldo Boyce had fired his opening kick against the bar. Daquon Foster and Shoaib Khan restored brought Naparima back into the shootout after Kareem John and Obadele Dickson produced superb spot kicks for the Bourg Mulatresse boys. Captain Fernandez then turn the tide as he palmed away the 16 year old Morris’ spot kick. 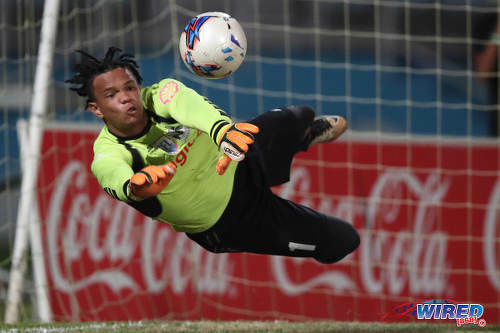 Photo: Naparima College goalkeeper Levi Fernandez saves a penalty from San Juan North Secondary forward Jerry Morris during the National Intercol final at the Ato Boldon Stadium on 4 December 2018. His brilliant save paved the way for Shippley to convert the winning penalty. 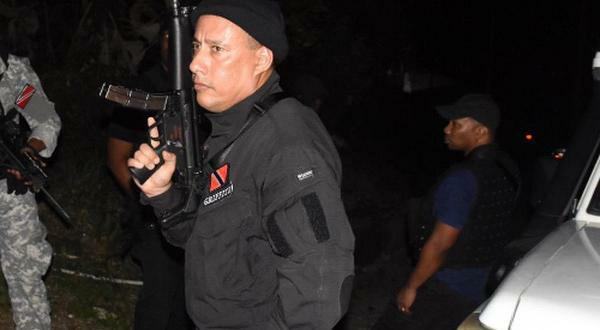 “We know how penalty shoot outs can go,” said San Juan North manager Stephen Clarke. “In our last penalty shoot-out against Trinity East for the East Zone Intercol title, we used the same bunch of guys in the same order and everyone scored. They were perfect. It was San Juan North’s third successive Intercol final and the second straight time that they had to settle for second place. 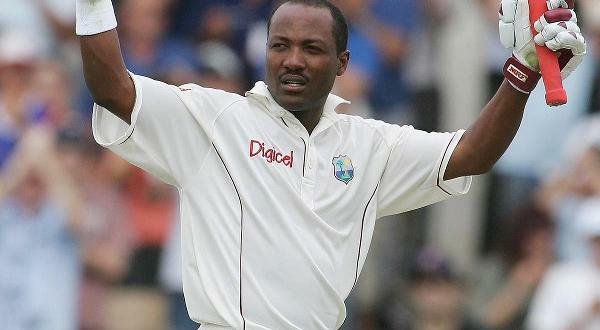 “It was a relatively balanced game,” said Clarke, “[but] one team has to win and one team has to lose. Unfortunately it was San Juan [who lost] but we will come back and fight next year. And thus the curtain closes on another SSFL season. Photo: SSFL president William Wallace (far left) poses with National Intercol champions Pleasantville Secondary at the Ato Boldon Stadium on 4 December 2018. 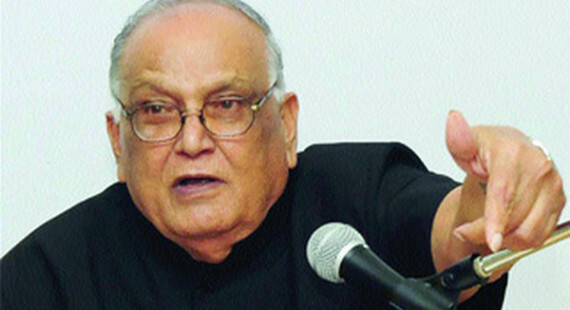 *—Naparima won 4-3 on penalties. Congratulations to the ladies… Not enough pictures of their celebration. Again it’s A _____ thing! Nathaniel Perouse is building up quite the CV now. Yeah the first time I saw him play was in the Republic Bank League about three years ago. Even from then he sounded like a focused and determined youngster. bro…this place gettin frikkin MAD yes!